Yesterday I found a young cow (moose) sitting & resting in our backyard. She apparently spent a good portion of the night there. I alerted four out of six of our B&B guests. 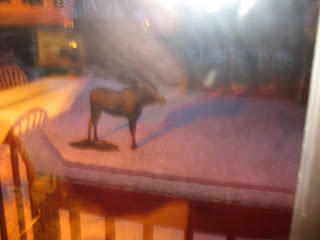 One guest took this surreal picture from our dining room looking out at the moose in the early morning. Today our guests we treated to seeing a juvenile bull (moose.) No pictures were taken.